A PREVIEWS Exclusive! The world's most dangerous assassin, Deathstroke is re-imagined unmasked in this exclusive figure! 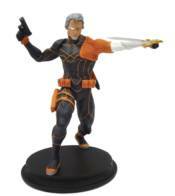 Weilding both his gun and sword, and wearing his costume from DC Rebirth, Deathstroke stands about 8' tall and is made from high quality polystone. Add him to your collection today!